At approximately 9:30 a.m. EST on Thursday, August 6, the popular social networking Web site Twitter was shut down for about two hours while other sites, such as Facebook and LiveJournal, experienced glitches of their own. To many regular users of Twitter, the outage was more than an inconvenience. "You know how you pat your pockets for your cell phone and your keys? Well it’s that same kind of phantom [limb] with Twitter," 24-year-old Christina Cimino told CNN.com. "It’s like, ‘I can’t update! I can’t update!’ It’s just one of those bugs that gets in you…It feels like a lifeline for me." The varied responses of many Twitter users after the service was restored made the incident the most linked-to news subject last week. From August 3-7, more than a third (35%) of the top news-related links were to stories about the outage according to the New Media Index from the Pew Research Center’s Project for Excellence in Journalism. And the story didn’t even emerge until late in the week. But on Friday morning, fully 73% of top Twitter news links were to stories about the outage, according to the tracking site Tweetmeme.com. The attention given to the outage speaks to a popular trait found in the New Media Index-social media talking about social media. From planned changes in Facebook’s terms of service (February 16-20) to a profile of Twitter’s San Francisco office (July 13-17) and a discussion of a Harvard study that downplayed Twitter’s importance (June 8-12), a fascination with the technology itself has emerged in this genre. None of these stories generated much attention in the traditional media. Last week also marked the first time in eight weeks that a subject other than the political unrest in Iran led the discussion on Twitter. 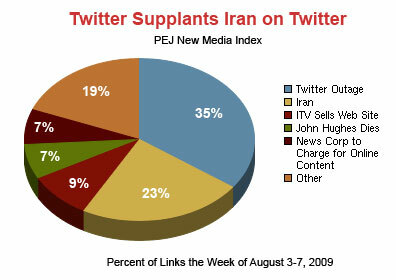 Iran was still prominent, finishing second with 23% of the week’s links. But that was far below the attention it received over the last two months following the June 12 presidential elections. In the blogosphere, a very different subject topped the news agenda last week: A New York Post report (24% of the links) about a 27-year-old woman named Trina Thompson who was suing Monroe College in The Bronx for not doing enough to help her find a job after graduation. Interest in this story was so great that it led the discussion for four straight days, according to the tracking site Icerocket.com. The second-largest topic on blogs (at 19%) was the release and homecoming of American journalists Laura Ling and Euna Lee from North Korea. The story also ranked third in the more traditional press last week, filling 11% of the overall newshole. Third on blogs (at 11%) was a link to a BBC page that included a song by the British band Radiohead written in memory of Harry Patch, the last surviving veteran of World War I who died on July 25. The fourth-biggest topic (8%) involved several stories detailing the struggles between old and new media, including a Washington Post article by Ian Shapira on how the Web site Gawker "ripped off" an article he had written for that paper. The news agenda for the traditional media was quite different than that of social media last week. The debate over health care was the No. 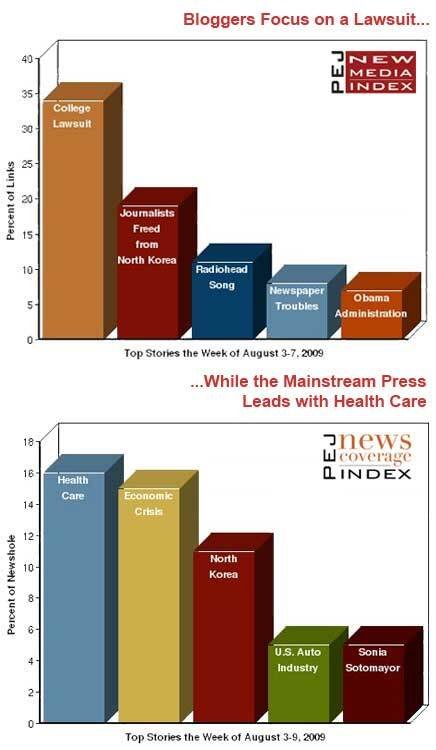 1 story, filling 16% of the newshole in the mainstream press according to PEJ’s News Coverage Index. That was followed by the economy (15%), the journalists released from North Korea (11%), the U.S. auto industry (5%), and the confirmation of Supreme Court Justice Sonia Sotomayor (5%). On YouTube, the most viewed news videos dealt with a number of the hot-button issues of the day-particularly health care. Several focused on different aspects of that debate, including statements made by President Obama and the behavior of those attending the often heated and confrontational town hall meetings around the country. The morning following the Twitter outage, users focused on what happened. It was the result of a denial-of-service attack (commonly referred to as DDoS) which is when a network of many computers, usually led by a single hacker, tries to overwhelm a Web site’s servers and bring the site down. Hundreds of tweets included links to a Time.com story that explained the attack. Others focused on a CNN.com story about the incident. Many users also noted that they first became aware of the CNN story from a seemingly unlikely source-the Twitter feed of actress Alyssa Milano. Milano, who has more than 147,000 Twitter followers, posted a link to the CNN piece at 10:10 a.m., approximately an hour after the attack began. She wrote, "CNN full story of DDoS attack and what DDoS means: http://bit.ly/StWZB (Via @Shawn_Mahnke)." A number of Twitter users included her name next to their links to the piece, which is a common way for tweets to cite their source for a particular story. In addition to linking to descriptions of the incident, some Twitter users offered their view of the attack. "Looks like some Cyber Jerks attacked Twitter last Thursday…Lighten up, peeps!…" tweeted The Cabo Diablo. "You know your website is big when it being down makes the front page of CNN.com!" added fueledbyryan. "How bizarre is this? I wanted to twitter about it… but couldn’t :-)," wrote Sheila Gallant Hallora aka sheila_gh. If Trina Thompson was looking for support for her lawsuit against Monroe College, she did not find much online. "Forget about their [Monroe College’s] effort, Ms. Thomson, what about hers?" asked Doug Mataconis at Below the Beltway. "Did she, like so many other college grads, expect to simply be handed to big-money job with the cushy office once she took off the cap & gown?" "I know tons of people with considerable work experience, who don’t have stripper names, and who have been unemployed for way longer than four months," criticized breadwinner at In This Economy. "Because I don’t know if some of you have noticed, but we’re in a bit of a recession here." Even those more sympathetic to Thompson’s concerns were not willing to give her a free pass. "I understand her frustration. There’s a lot of marketing by educational institutions lately to all the poor souls who are out of work, or wondering how to find better jobs," wrote journalist Eve Tahmincioglu at CareerDiva. "It would be nice if we could hold their feet to the fire after we pony up the big bucks for a degree, but that’s not how it works. We can’t blame others for our failure even if in some way they are to blame for it." When it came to the return of imprisoned American journalists Laura Ling and Euna Lee from North Korea, bloggers focused primarily on the role Bill Clinton played, with some also wondering if the U.S. had paid too high a diplomatic price. "Bill Brings Them Home!" cheered AGUYNAMEDWAYNE at The Wow Report. "You have to hand it to Bill Clinton whether you like the man or not," added George Hall. "He himself went to North Korea and arranged for the Pardon and the release of two American Journalists that were being held captive. This is a pretty bold move by a former President in dealing with the little nutball from North Korea." But while bloggers were glad that the journalists were returning safely, some expressed concerns about what North Korea might have gotten in return. "What quo did President Barack H. Obama, via Bill Clinton, give him (North Korean leader Kim Jong Il] to balance the quid of releasing the two hostages?" wondered Dafydd at Big Lizards. "I suspect what we offered Kim is itself a grave crime: I believe the only thing that would tempt Kim Jong-Il into releasing his bargaining chips is if he got the very bargan he wants…to be treated as leniently as Obama treats Iran on the same issue, the development of nuclear weaponry." The most viewed news videos on YouTube last week involved a number of the contentious political topics of the day. The most viewed news video on YouTube last week was a montage of clips from various speeches given about health care-most by Obama. Entitled "SHOCK UNCOVERED: Obama IN HIS OWN WORDS saying His Health Care Plan will ELIMINATE private insurance," the video aims to show that the President has contradicted himself on health care and that he, along with other Democrats in Congress, are in favor of someday creating a single-payer health care system. Among the other top videos were clips from a contentious town hall meeting in Texas, a claim by Fox News host Glenn Beck that the government was trying to take control of people’s computers, an interview with a leader of the "birther" movement and a Web ad by the Democratic National Committee that claims Republican-led "mobs" are angry and desperate. 2. Footage from an August 1 town hall meeting with Representative Lloyd Doggett in Austin, Texas, where the crowd is chanting, "Just say no!" 5. A Web ad by the Democratic National Committee that criticizes the "mobs" of the Republican Party that are trying to "destroy President Obama"